Drama/Comedy/Crime/Gainful, West Germany/Czechoslovakia, 1975, 100 min. Synopsis A Jewish ghetto in the east of Europe, 1944. By coincidence, Jakob Heym eavesdrops on a German radio broadcast announcing the Soviet Army is making slow by steady progress towards central Europe. 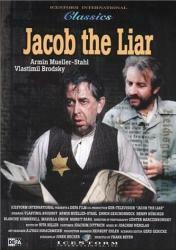 In order to keep his companion in misfortune, Mischa, from risking his life for a few potatoes, he tells him what he heard and announces that he is in possession of a radio - in the ghetto a crime punishable by death. It doesn't take long for word of Jakob's secret to spread - suddenly, there is new hope and something to live for - and so Jakob finds himself in the uncomforting position of having to come up with more and more stories.